AWS Shield Advanced has always notified you about DDoS attacks on your applications via the AWS Management Console and API as well as Amazon CloudWatch metrics. 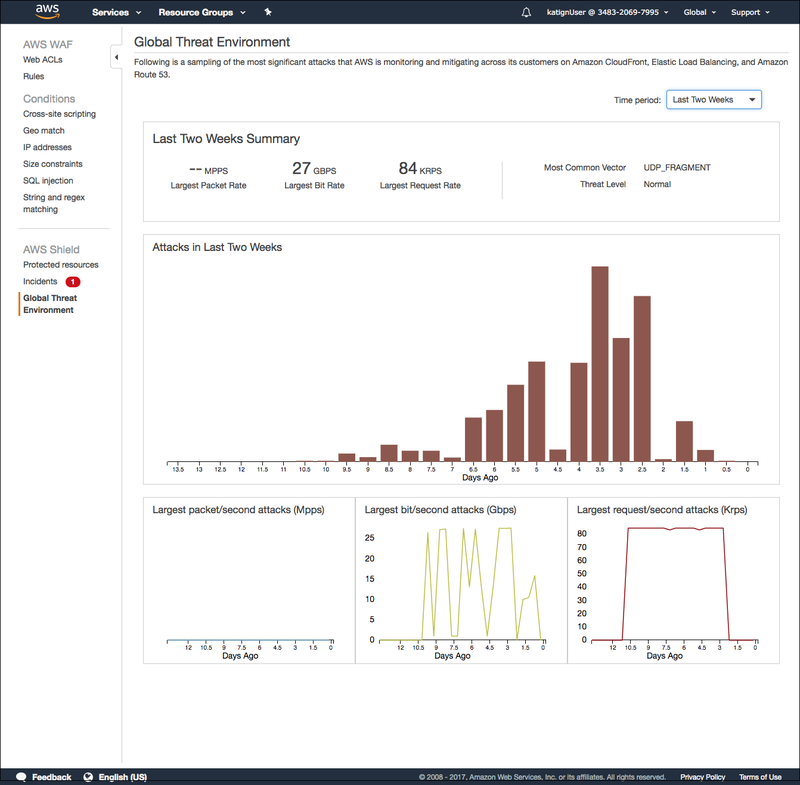 Today, we added the global threat environment dashboard to AWS Shield Advanced to allow you to view trends and metrics about DDoS attacks across Amazon CloudFront, Elastic Load Balancing, and Amazon Route 53. This information can help you understand the DDoS target profile of the AWS services you use and, in turn, can help you create a more resilient and distributed architecture for your application. The global threat environment dashboard shows comprehensive and easy-to-understand data about DDoS attacks. The dashboard displays a summary of the global threat environment, including the largest attacks, top vectors, and the relative number of significant attacks. You also can view the dashboard for different time durations to give you a history of DDoS attacks. Sign in to the AWS Management Console and navigate to the AWS WAF and AWS Shield console. To activate AWS Shield Advanced, choose Protected resources in the navigation pane, choose Activate AWS Shield Advanced, and then accept the terms by typing I accept. Navigate to the global threat environment dashboard through the navigation pane. Choose your desired time period from the time period drop-down menu in the top right part of the page. You can use the information on the global threat environment dashboard to understand the threat landscape as well as to inform decisions you make that will help to better protect your AWS resources. To learn more information, see Global Threat Environment Dashboard: View DDoS Attack Trends Across AWS.